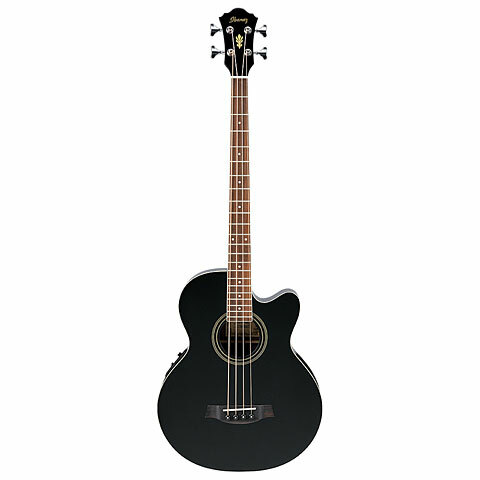 Sharing the same body style with the AEL series guitars, the Ibanez AEB8E electro acoustic bass's fat tone will endear the AEB to any bass player. With a SST preamp with a built-in electronic tuner, and a thick resonant body, the AEB8E is the perfect stage bass for your next unplugged gig. In addition to the 1/4" output jack, the AEB8E features a balanced XLR jack for direct connection to the house PA. Powered by found everywhere AA batteries avoids the risk you cannot find a replacement battery. Ibanez SPT preamp on the Ibanez AEB8E has a 3-band tone control and Shape control along with a built-in electronic tuner. Balanced XLR & 1/4" Outputs. Pickup: Ibanez Under Saddle Pickup. Nut & Saddles: Ibanez Ivorex II. Bridge Pins: Black Plastic Bridge Pins.